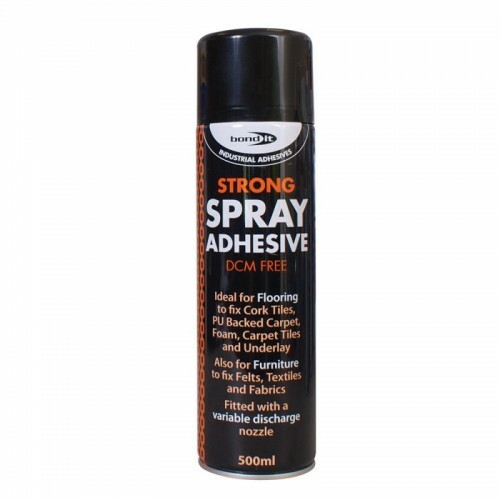 Gives exceptionally strong adhesion for a wide range of demanding uses. Fitted with a variable discharge spray that controls the width of the fan. DCM free. Use on wood, concrete, stone, tiles, rubber, foam, metals, rigid plastics, polythene, canvas fabrics, cardboard, paper and cork. It is ideal for perimeter bonding of carpet tiles and minor flooring installations, and for use in the furniture, and automotive industries, especially for bonding foam to a variety of surfaces. Also suitable for use in repair and non-structural applications where a high strength bond is required.